While growing up, most of us have been told not to play with our food, but researchers at De Montfort University in Leicester discovered that when kids play with their food they’re more likely to eat it. Not only does transforming food into culinary masterpieces makes food fun and exciting to eat for kids, but parents also enjoy seeing their child eat more fruits and veggies. Although most kids are experts at playing with food, just in case you’re looking for a few structured and fun ideas to get started with “food play”, I’ve listed some of my favorites. 1. Turn Ordinary Foods into a Funny Face. Use a plate for a round face then add your favorite foods to build the face. Olives and grapes make great eyes while carrots are perfect for noses. The red hue of watermelons and tomatoes make for perfect mouths and broccoli and cauliflower are perfect for hair. 2. Cut Your Food Into Fun Shapes. Who says cookie cutters can only be used for cookies? They can be used to make fun shapes with whole grain bread, pizza, deli meat, cheese, and even fried eggs! Food doesn’t need to be flat. Use toothpicks to link carrot sticks, celery stalks, or gluten free pretzel sticks to build things! By adding more dimensions to your food, you’ll awaken the creativity in even the pickiest of eaters. Use thin strips of almost any vegetable to create a game board. Nitrate free pepperoni, sliced boiled eggs, and cherry tomatoes all make fantastic game pieces. 5. Think “inside” of the box. Join a monthly subscription box service and get culinary activities delivered to your door. My favorite, is the one I founded to inspire kid chefs and kids learning to cook called kifoodie. 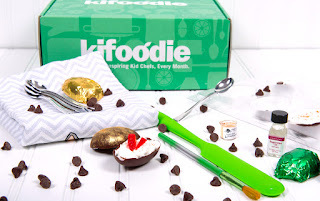 Inside every kifoodie Experience Box, kids get kitchen gadgets, non-perishable foods and activities designed to inspired kids to invent culinary masterpieces again and again! 6. Squash, Pound and Mash. Whether it’s wondering what the inside of a blueberry looks like or wishing you could see how a carrot would respond if it was darted with your finger, kids are curious! Feed into the curiosity by letting them use their fingers to squash, a fork to mash and a bag to pound their fruits and veggies. Then use their “puree” for smoothies, as a jam over toast or the key ingredient for freshly baked bread. By letting kids explore different textures of food, you’ll encourage the little scientist and foodie within. Written by Kim Young, founder of kifoodie. Kifoodie is a monthly subscription box designed to inspire kid chefs and kids learning to cook. At kifoodie Experience Boxes are packed with 2-4 kitchen gadgets and products, an amazing culinary activity (with a healthy twist), recipe, shopping list, badge and a mystery bag of 3-5 artisan treats and snacks hand-picked to inspire the kid foodie and kids learning to cook. Visit www.kifoodie.com now to learn more about these monthly experiences shipped right to your home.